FPS에서 생산하는 Mill은 Application에 따라 여라가지 종류가 있습니다 Spiral Jet Mill, Q-Mill, Mechanical Mill, Multimilling Flatform, R＆D unit Mill, Pro Mill 등 사용 목적에 따라 다양한 제품을 공급하고 있습니다. URS에 따라 Customized 하여 개발하며 Customer 요구사항에 맞춤 제품을 생산합니다. Spiral Jet Mill, Q-Mill, Mechanical Mill, Multimilling Flatform, R＆D unit Mill, Pro Mill 등 사용 목적에 따라 다양한 제품을 공급하고 있습니다. URS에 따라 Customized 하여 개발하며 Customer 요구사항에 맞춤 제품을 생산합니다. 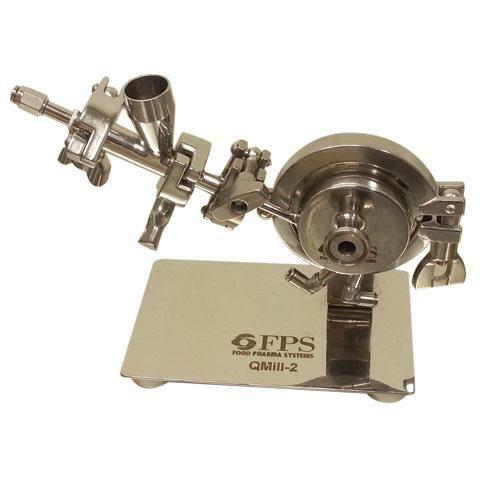 The QMill-2 is designed for R&D laboratory needs. Starting PSD of raw material is 1mm approx. Bench top design assures easy placement on any laboratory desk or hood. 필요하신 사양이 있으시면 URS를 통해 정확한 모델 및 사양을 선택하실 수 있습니다. 문의사항은 (주)크렌비텍 031-8027-2121 로 전화 주시기 바랍니다.